360 Total Security is a popular and free security and/or system optimization software developed by Qihoo 360, an IT company based in China. The security aspect of 360 Total Security focuses on detecting and removing computer viruses, malware, and trojan horses through 360 Cloud Scan Engine, System Repair Engine, QVM Ⅱ AI Engine, Avira Engine and BitDefender engine. After installing 360 Total Security, a right click contextual menu for files and folders has an additional entry, namely Scan with 360 Total Security. In order to housekeep and reduce the bloatness of right click contextual menu, and you want to remove and hide the “Scan with 360 Total Security” item, the program has an option to easily turn if off. 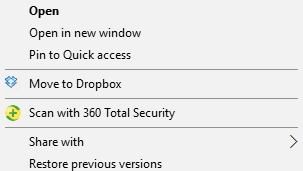 To remove the “Scan with 360 Total Security” on the right click contextual menu, open the 360 Total Security program, then open the Menu (icon on the top left corner). Then, go to Settings -> Virus Scan. Deselect the Scan file with mouse right-click option under “File Scan” section, and the entry will be removed from right click menu instantaneously.